Belt Technologies is the world’s leading manufacturer of complete vacuum conveyor systems utilizing stainless steel perforated metal conveyor belts. Vacuum conveyor systems by Belt Technologies incorporate the advantages of stainless steel metal conveyor belts, which are virtually unstretchable, operate without lubrication, and minimize variations in surface speed for increased efficiency and throughput. Belt Technologies provides high-performance stainless steel vacuum belt conveyors for the production of solar cells, which can increase the throughput efficiency of solar panel production. Belt Technologies engineers design custom metal vacuum conveyor belt systems that are able to withstand a range of demanding production environments. 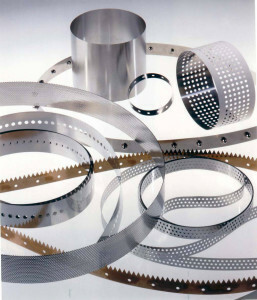 Perforated metal vacuum belts provide a hard, smooth, flat surface that’s ideal for processing, printing, and inspection. Because stainless steel metal conveyor belts do not generate particulates, manufacturers can increase product throughput with less downtime spent on cleaning or removing debris buildup. As a result of customizable perforation patterns, perforated metal belts provide a level of precision and accuracy not attainable with traditional systems. Belt Technologies manufactures and assembles complete vacuum conveyor systems in ISO-approved, state-of-the-art facilities to ensure the products are functional within strict quality-control parameters. Perforated metal belts are flat, endless metal conveyor belts manufactured with precision perforations. Perforations in a metal belt allow for the passage of air drawn through grooves in the vacuum plenum of the conveyor. This creates a suction effect that will hold flat product materials to the belt surface for maximum positioning control. Our stainless steel conveyor belts are designed and manufactured based on the specific needs and specifications of our customers. A variety of different perforation patterns and sizes are possible. Our engineers can provide design feedback and technical support to ensure the maximum efficiency of your perforated metal conveyor belt. We use a variety of perforation methods based on the dimensions of the belt and the operational requirements of the vacuum conveyor system. Methods include high-impact mechanical punching, chemical etching, and laser cutting. Coatings and surface treatments for perforated metal conveyor belts are also available. Our engineers will help you determine the right coating and product requirements for your system.